This was a wonderful challenge, that not only had me consider the amazing, simple things I've seen when traveling, but to look more closely at the exquisite, everyday things around me at home. I reconsidered the garden spider, the germination of a seed, a cup of coffee with a friend..... All around me, extraordinary things are happening and appear so ordinary in our busy lives. Perhaps when we travel, we have time to consider what is around us with a more receptive mind. Then, it seems I can better appreciate a new approach to the predictable or when common sites converge into poetry. 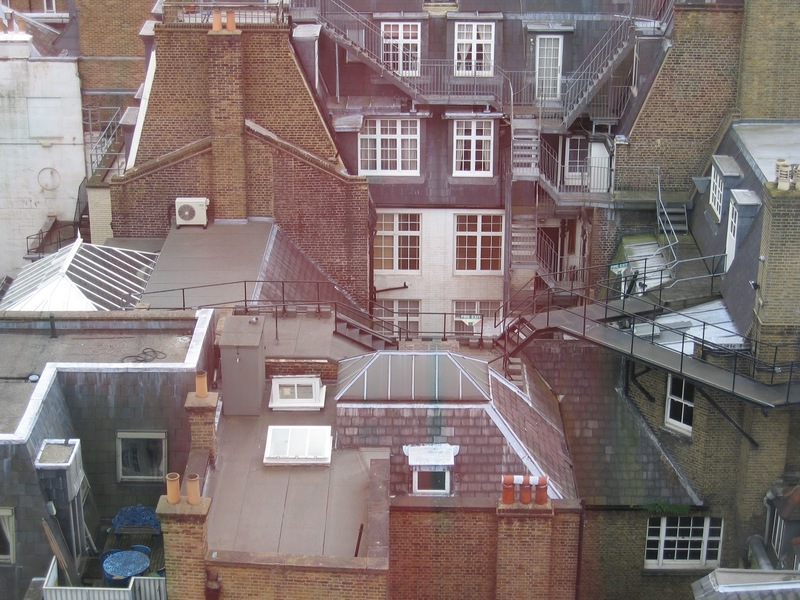 Thus was my experience with the chance, probably less desirable, view from a hotel window in London. There was so much movement in all the lines - - and the fascinating way one rooftop connected to the next, on and on - - with Bert and the chimney sweeps dancing across. This photo has hung around my studio for over 10 years with the hopes of interpreting it into something. So it is now the extraordinary in the ordinary. Creating "Rooftops of London" was a huge challenge. I edited and edited and soon it took on a life of its own. The more I added, the more I needed to add.....until we stop! 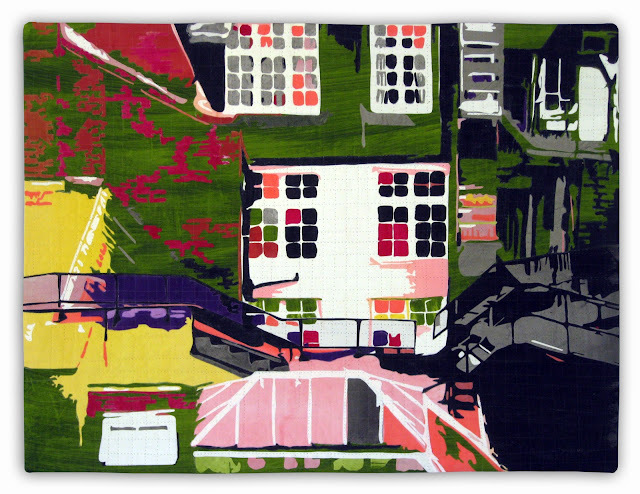 "Rooftops of London"was created with painted silk habotai, fused, raw-edge appliqué and machine quilting. Thank you, Sue, for a wonderful challenge, and for reminding me to open my eyes and mind to acknowledge the beauty in the ordinary. Holy Moly! That is SO cool. I love it! Thanks, Diane - it's always fun (or *? *) to step back and see if it worked! bringing color and light into a gray city! I never think of London as gray, we seem to have been very lucky with good weather. Wow! I love this piece, especially your use of color. The repeating shapes and varied lines give this piece so much LIFE. Fantastic. I agree with what everyone has said- an amazing perspective, colour-wise and the perspective of the very ordinary transformed. I'm happy that everyone had so much fun with this challenge. Thank you, Sue, and thanks for a great challenge! I know for me, it was a great exercise in what is important to me and it seems everyone really enjoyed it! The photo reminds me of my trip to Europe (France and Italy) 12 days ago. I can still feel the cold weather in my heart. Your idea is fresh and amazing! Bravo! I also learned a lot from this challenge. Thanks to Sue. All I can say is WOW!! What a fantastic piece, Martha! The colors, the light and shadow of the piece, truly wonderful. You really made something very ordinary extremely extra-ordinary.